As is my wont this post got a bit long, so if you want to skip to a specific part here’s links to the discussion of spells, their costs and performance, Spirit Shell, Rapture, Talents and Glyphs. Bear in mind that I’m still only level 86 as I write this, and the experience changes a lot as you level up. Notice that the mana costs are all nice neat round numbers. That’s because all healers now have a fixed mana pool of 100,000 MP (except gnomes, who have 105,000 MP thanks to our racial!) and spells cost a fixed percentage of our maximum mana. No huge surprises in there this time, so I won’t go into too much detail. Most of the spells are where they have been in Cataclysm, which is nice. Flash Heal and Power Word: Shield remain our fast, expensive emergency heals. They have pretty punishing HPM and high costs, but they’re quick. Penance is still earning its cooldown with comparable HPS to Flash Heal but half the mana cost, and Prayer of Healing is still good when you have 3 or more people to heal up. This is a helpful little nugget to nudge new players in the right direction when picking up a spec for the first time, or returning to a spec after a while away. It might be nice to draw attention to this tab more obviously, maybe as a tutorial tip, because it’s not even in the Talents window so you could easily overlook it. While for a while Spirit Shell was an absorb replacement for Greater Heal, that design was rolled back in a recent build in favour of giving us GH back and redesigning Spirit Shell. Personally, I like what they’ve done with the spell. Spirit Shell is a 15s self-buff on a 1 minute cooldown that turns all the heals you cast into absorbs with their own 15s duration. According to Ghostcrawler it’s been designed to take account of Divine Aegis (by increasing the size of the bubble by your crit chance so if, for example, you have 20% crit chance your bubble will be 120% of the size of the heal), the bubble size benefits from Grace in the same way the original heals would, and the bubbles also scale with Mastery. Note that the bubbles don’t “crit”, your crit chance has already been taken into account. To put some numbers on this, imagine you hit Spirit Shell, then cast Greater Heal on your tank. Suppose, for the sake of argument, a baseline Greater Heal is good for 50,000 HP. I have 15% crit chance, so that gives me a bubble of 50,000 * 1.15 = 57,500 HP. I also have 25.73% stronger bubbles from Mastery, which takes my bubble up to 57,500 * 1.2573 = 72,295 HP. Add in a triple-stacked Grace for a 30% boost, and my Greater Heal bubble is up to a whopping 72,295 * 1.30 = 93,983 HP. The current implementation is still a little early. Currently it’s not actually benefiting from any of those extra effects so we’re stuck with the basic heal. There’s also the open question, which Ghostcrawler acknowledged is still one they don’t have an answer for, of how stacking and capping these bubbles will work. Currently the Spirit Shell shields from different heals stack with each other (they create separate buffs for themselves depending on the spell) but casting the same spell twice refreshes the duration but replaces the absorb amount with the latest value, even if it’s lower. I expect both of these behaviours to change and I wouldn’t be surprised to see the effect end up working more like DA does, where all the heals contribute to a single bubble buff which stacks up to a cap. The developers did point out that they don’t like us feeling like we need to spam something up to a cap (PoH/DA, anyone? ), but I don’t think I mind that sort of mechanic. We’ll have to see how it plays out. The utility of this is centred around preparing for and preventing damage. Know the Elementium Bolt is about to splash down, or your tank’s going to get Impaled? Get those bubbles out there to take the edge off it. The fact that it scales with Mastery means that you’ll get a slight healing boost out of this cooldown as well (Mastery affects the whole bubble, rather than just the DA portion of the heal), but the tradeoff if that you’ll have to have enough damage coming out to take proper advantage of the absorbs. Rapture is something of a vexed subject at the moment. Rapture, on Beta and on Live, returns a lump of mana when your PW:S breaks; on Live it’s a fraction of your total mana, on the Beta it’s 150% of your Spirit. On Live this is (significantly) more than the PW:S cost to cast, making it an important source of mana regeneration, whereas on Beta the return is less than the cost of PW:S.
If we consider Rapture as a regeneration mechanic, it’s a slightly problematic one. The objections been gone over several times, including in the links above, but they more or less come down to difficulties in getting PW:S to break reliably when the damage is light or unpredictable or cases where you have multiple Disc Priests fighting over opportunities to bubble a single tank. Rapture isn’t trying to be Telluric Currents. You shouldn’t spam PW:Shield when you need mana. Rapture is intended to offset the cost of PW:Shield when the latter is used intelligently. So instead of thinking of Rapture as part of our mana regeneration, instead we should think of it as a discount on casting PW:S as long as we don’t do it too often and pick a target that’s actually going to take damage. Think of it as a proc like Surge of Light, giving us a cheap PW:S every now and then instead of a free Flash Heal, only it doesn’t proc randomly but activates every 12 seconds instead. I still think there’s a possible issue with PW:S needing to break, especially in the case where you have two Disc Priests fighting over the damage, but you can at least see why that design is there, and that might be an application of the Divine Insight talent (call-ahead!). Have a look back at the table, and look at the HPS and HPM of PW:S with and without Rapture. Without Rapture it’s still our best HPS ability, but the cost is punishing. Factor in a Rapture proc though and it’s suddenly right up there with our best HPM abilities as well. There’s still one small wrinkle though, and that’s Meditation. You see, Meditation for Disc Priests is 25%, whereas it’s 50% for every other healing spec. The reason for this is that because Rapture makes PW:S so cheap and so powerful (when we weave it in) we can achieve the same output as the other specs for a smaller mana cost. To balance out this lower cost, our background regen is lowered to match. The upshot is that if we don’t use PW:S at all, or don’t use it especially intelligently, we’ll end up a little behind the other specs mana-wise. If we use it exceptionally well, we’ll potentially end up ahead. Now the ball’s in Blizzard’s court, and they’ll need to tweak the numbers as the Beta progresses and we hit the level 90 content to make sure we’re balanced. I’ve not done a talent run-down in a while, so let’s see where we’re at with those. Level 15 remains the “CC” tier. Void Tendrils summons a Tendril for every mob within 8 yards of you that roots it for up to 20 seconds; Psyfiend lets you spawn a Psyfiend at a location you choose that fears a mob attacking you every 1.5s; Dominate Mind is Mind Control. Videos of the first two are below for your enjoyment. Personally I’d go with Void Tendrils as my standard pick, just because fear is often a risky proposition. But I can see a lot of value in the Psyfiend in PvP. Throw it down on a flag or into a tower and watch the fun, or maybe just use it to keep people off you. At Level 30 you’ve got the movement talents. Body and Soul is the same ability we’ve known and envied for two expansions, only now it’s available to all Priests regardless of spec. The contender for PvE is Angelic Feather, which lets you place up to 3 feathers on the ground that grant a movement speed boost to the next person to step on them. If you have a known kite patch or need to keep someone moving at speed for a while then Angelic Feather is stronger than Body and Soul, but Body and Soul is more flexible if you just need to get someone moving and don’t necessarily know who it’s going to be. Tailor your choice to the situaion. Phantasm looks at first glance like more of a PvP choice, although don’t rule it out entirely for PvE either. It makes your Fade remove all movement-impairing effects and makes you untargetable by ranged attacks and immune to movement-impairing effects for 3 seconds. The untargetability might have niche applications (I wonder if it would make you immune to Shrapnel, for example) but the freedom of movement could be handier. I suspect the choice will usually be between Angelic Feather and Body and Soul for PvE, but it’s nice to have the option of Phantasm as well. Level 45 is the first tier where you get to actually improve your output. From Darkness, Comes Light (FD,CL), which still has that extraneous and slightly grating comma, gives you a 15% chance to proc a free, instant Flash Heal when you use (most of) your single-target heals. The list includes Smite, but not Penance or Holy Fire; this may change, I’d certainly expect to see Penance in that list. Given the high HPS of Flash Heal, this is a strong talent if you’re using a good number of single-target heals. Mindbender replaces your Shadowfiend and deals double the damage and gives back double the mana. Because everything scales off base mana and base mana is fixed, your Mindbender will return 72% of your mana bar (assuming he doesn’t miss) compared to 36% for the Shadowfiend. This extra mana allows you to use more of the expensive spells, and is a great choice if you don’t think you’ll see the benefit of FD,CL, if you’re AoE healing, for example. And finally we have Archangel, another old friends that’s been opened up to all three specs. This is a straight up output boost for 18s on a 30s cooldown, assuming you’re able to weave in the requisite number of Smites, Holy Fires and Penances to stack Evangelism up to 5. That’s right: Penance stacks Evangelism now, one stack per tick, and causes Atonement heals as well, so you shouldn’t have any trouble getting Evangelism stacked. In this tier you’re picking what you need. The first two are all about efficiency, the third is about simple output. I suspect we’ll shift from the left to the right as the expansion progresses and mana becomes less of an issue, and at the start we’ll be interested mostly in FD,CL for tank healing and Mindbender for raid healing, although I’ll admit I’ve not sat down and worked through them in detail yet. Level 60 is all about taking care of yourself. You get a choice of an instant 30% self-heal on a 2-minute cooldown (Desperate Prayer), a shield for 20% of your HP when you’re damaged below 30% of your health every 90s (Angelic Bulwark) and the new Spectral Guise. Spectral Guise is an interesting talent. When you hit it you spawn a clone of yourself which your enemies will attack, while you get stealthed for 6 seconds or until your clone (“your true form”) is hit 3 times. You can either use the time to run away or to throw a couple of heals on yourself unimpeded. Spectral Guise feels more solo- or PvP-orientated than the other two since you don’t often take direct attacks as a healer in raids, but it may be useful to save you from a powerful attack directed your way (again Shrapnel comes to mind), since you don’t share in the the damage your clone takes. Here’s where things get really weird, with a jumble of talents. Twist of Fate gives you a 15% damage or healing buff after damaging or healing a target under 20% HP. I can see this possible being useful for handling low-health enrage phases: throw a HF on the boss at 19% and enjoy 15% extra healing for a while, as well as the more orthodox behaviour of rewarding triage-style healing of the lowest people when the raid is weakened. Alternatively you could go for Power Infusion for 20% faster, 20% cheaper spell for 15s every 2 minutes either for you or for a friend. The real wildcard is Divine Insight. For Disc Priests this procs from Penance casts and allows your next PW:S to ignore and to not cause Weakened Soul. I can see two main uses for this. It’d be pretty handy if you needed a quick throughput boost on a single target because it would let you to throw out a PW:S, Penance, PW:S combination, and it would also be useful to let you maximise the frequency of your Rapture-cheapened PW:S casts even if you or another Priest has already got Weakened Soul on your target. Until we’re able to actually play with these all we can do is speculate. I’ll link the three options, but reserve comment until they’re opened up on the Beta. Cascade, Divine Star, and Halo. Since the Prime Glyphs have been removed, we’re left with the utility-focused Major Glyphs and the cosmetic Minor Glyphs. The minors are all more or less unchanged. Shadow Protection went away with the removal of spell resistances, and we got Glyph of the Heavens instead. This one makes your Levitate targets appear to be floating on a cloud. Funky! As for Majors, a lot are unchanged, but there are a few interesting changes. Glyph of Dispel Magic – Deals damage when you dispel an enemy, rather than healing when you dispel a friendly. Glyph of Purify – Heals 3% of max HP when you dispel a friendly. Dispel Magic is now our offensive dispel, while Purify is our defensive dispel/cleanse ability. Glyph of Fade – Reduces all damage taken by 10% when you Fade, which could be mighty handy. Glyph of Holy Fire – Makes Holy Fire instant-cast. Doesn’t save you any time if you’re able to stand still, but could add a valuable extra tool to our healing-on-the-run toolkit. Glyph of Levitate – Increases your movement speed by 10% while you’re levitating and for 10s afterwards. Glyph of Penance – Allows you to cast Penance while moving, but increases the cost of Penance by 20%. If you need healing on the run this is a good bet. The cost just stops it from being a no-brainer. Glyph of Power Word: Shield – Similar to the old version, but where the healing used to be a bonus, this time the healing is taken out of the absorb instead. A quick mini-post/ramble before the Priest spells post that’ll follow shortly. Prime glyphs may be removed. Now, note the word “may” in there. This is a thought thrown out there, not a well-thought-through design plan. However it did interest me, because it occurred to me when I was thinking about the new talents that they look a little like prime glyphs on steroids, especially when they’re said to be changeable as easily as glyphs are changed now. That means not one but two things that really ought to be tweaked boss-to-boss to optimise your character for the encounter (I know you can go and respec now, but given the time cost involved it’s something I tend to reserve for the trickier progression bosses only). Removal of prime glyphs makes a sort of sense, their function being more-or-less replaced by the new talents, which leaves glyphs pretty much where they were in WotLK, as either minor utility tweaks (Major) or purely cosmetic (Minor). On the subject of glyphs, it would be nice to get some more cosmetic customisation options to play with, which might make glyphs more appealing if their heavy influence on gameplay is removed with the prime glyphs: a different Shadowfiend (have a look in the Botanica, there’s a few different skins there to begin with), coloured Mind Sear/Flay beams, a choice of Divine Aegis bubbles (as if! ), there’s plenty that could be done. 28th October, 2010: Updated quite a bit, having spent a couple of weeks to play around and raid. The first iteration misjudged a few aspects, particularly just how much mana we’d have and the value of Heal and talents that work with it. I think I’ve fixed that now, so it should line up better with the reality of 4.0.1. Patch 4.0.1 is here, bringing with it some pretty big changes. In this guide I’ll cover talents and sample specs, spell changes, stat changes, gems, enchants, glyphs and some technique pointers. There’s still a lot of room for you to make your own choices to suit your playstyle and raid role, so engage your critical thinking skills before reading this or any guide. Also remember that this is still changing. Finally, this is aimed at level 80, not 85. Feel free to correct me in the comments and I’ll try and keep the post updated. Something to remember throughout the 4.0.1 experience is that the systems we’re using are intended for level 85 rather than level 80, so if it feels a bit odd, that’s probably why. Nowhere is this more true than in the case of talents, where you’re effectively 5 points short of where you’d like to be. I’ve skipped Mental Agility in Tier 1, because mana is currently not a problem at all. I’ve also put a single point in Inner Sanctum purely as filler, because I don’t see a huge need for this talent in the Wrath environment. It might prove invaluable in Cataclysm, but it’s just not valuable in WotLK. I also skipped Strength of Soul. It’s a nice idea for a talent, but it’s essentially useless in 4.0.1 since you’ll rarely, if ever, use Heal. It’s simply ill-suited to the damage profile of the encounters. The more straightforward omissions are Focused Will and Reflective Shield, because they’re PvP or solo talents, not raiding talents. Reflective shield only reflects damage absorbed by shields on you, and Focused Will is only useful if you’re getting physically hit, and you really shouldn’t be. Evangelism, Archangel and Atonement, work to form the core of the Smite healing setup. Matticus wrote about this in more depth recently, but the idea is that you can put out a good amount of healing at low cost by Smiting the boss and letting Atonement heal the tank. Pop Archangel to restore 15% of max mana whenever it’s off cooldown and Evangelism is stacked to 5. Train of Thought – When you Smite, you reduce the cooldown of Penance by 0.5s. Assuming Smite is a 2s cast, and Penance has a 10s cooldown when glyphed, if you do nothing but Smite you can bring that Penance CD down to 8s instead. It’s not a bad talent at all. The iconic spell, although currently it’s a little underpowered, since it’s used up and disappears in a very short amount of time. Use it selectively on small ground of people or location-specific effects, rather than on large raid-wide damage spikes. I had included a non-Smite build in here, but since you won’t be using Heal (so Strength of Soul is no use) and you don’t need the mana (no need for Mental Agility), realistically there isn’t anywhere to put the points freed up by dropping Atonement, Evangelism and Archangel. I’d suggest keeping the same spec, and just using Flash Heal instead of Smiting, if you really don’t want to use Smite. Once you’ve got your 31 points in Discipline, you have a few choices for your sub-spec. You’ll only have 5 points to play with, so you’ll really have to choose the talents that suit your playstyle and role in raids. Divine Fury – Reduces the cast time of Smite, Holy Fire, Heal and Greater Heal by 0.15s/0.35s/0.5s. If you’re going with the Smite/Heal healing model, this is probably your top priority. If you’re on bubble-bot duty, skip it. Darkness – 1%/2%/3% haste. Divine Fury is more powerful for the points if you’re Smiting, so if you take that then you’ll only have 2 points left. Darkness is a good place for them though. Empowered Healing – 5%/10%/15% healing to Flash Heal, Binding Heal, Heal and Greater Heal. 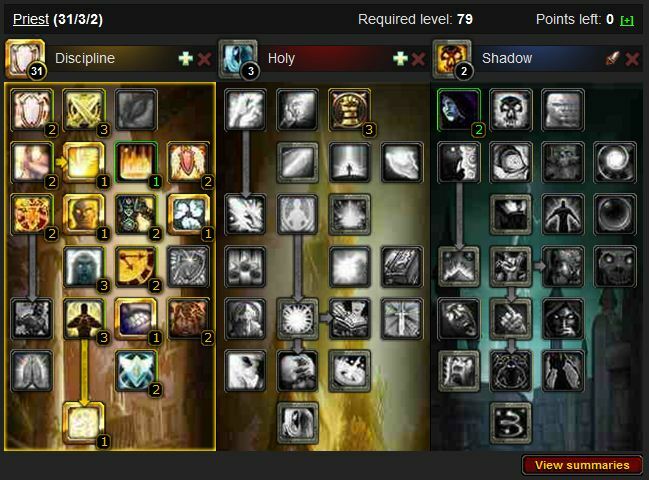 I’d favour Darkness at level 80 because we use these spells so little, especially with a Smite healing model. This is probably a good staple at 85, though. Improved Renew – 5%/10% to your Renew. Not a Discipline talent, really. Veiled Shadows – Reduces the cooldown of your Shadowfiend by 30s/60s. Not a good choice at 80, yet again because we just don’t need the mana. To Smite, or not to Smite? At the moment Smite healing is fun, different and very mana-efficient, and since you’ll be taking the points to support it in your spec anyway, I’d say give it a go. If you really can’t stand it, then you can swap Flash Heal for Smite in your rotation for now. I might not touch on all of the little changes, but I’ll try and hit on the big ones. Heal has been revamped with the goal of making it a viable filler spell at max level. It’s got the same cast time as Greater Heal, but heals for slightly less than a Flash Heal, and costs 9% of base mana compared to 28% for Flash Heal and 27% for Greater Heal. However, in 4.0.1 mana is so plentiful and damage so high that a small, slow Heal simply isn’t needed. If you’re Disc with an Atonement build, you’ll use Smite instead of Flash Heal, wherever possible, or just substitute Flash Heal if you need direct healing instead. Inner Fire hasn’t been changed much, but has had its charges removed so it’s simply a 30-minute self-buff now. Prayer of Fortitude and Prayer of Shadow Protection have been removed because Power Word: Fortitude and Shadow Protection have been made raid/party-wide by default. What’s more, the reagent costs have been removed. Although mana is not a problem at level 80, you might consider taking the Glyph of Fortitude as one of your minors now to avoid having to spend quite a large chunk of your precious mana to rebuff that rogue who stood in the whirlwind. There really aren’t any compelling alternatives anyway. Power Word: Fortitude is also now equivalent to the Blood Pact buff provided by Warlocks’ Imps, and won’t stack with it or overwrite it. Inner Focus has been given something of a revamp. It’s more restricted so now it’ll only give you a free Heal, Flash Heal, Greater Heal or Prayer of Healing (so your old Inner Focus + Divine Hymn macros are deprecated), but the cooldown has been slashed from 3 minutes to 45s. I’m leaning towards treating this as a passive mana saving “proc” by macroing it to Flash Heal, Greater Heal and Prayer of Healing to save a big chunk of mana when it fires. The exact number is 830.02, so you’ll need 831 haste to be at the soft GCD cap with BT and Wrath of Air. Without Wrath of Air, the number is 1036. Remember that if you can spare the points, you can always spec Darkness to reduce these. With 3/3 Darkness and Wrath of Air, for example, the cap is only 711 (or 910, without Wrath of Air). Power Word: Shield has had its base cooldown reduced to 3s (from 4s). Soul Warding allows you to subtract 1s/2s from this cooldown. However, you’re still limited by the global cooldown of 1.5s before haste, so it’s essentially no different to the current situation if you take 2/2 points here. HoTs no longer clip if you refresh them just before the final tick, which is a great change. What happens instead when you overwrite an existing HoT the game allows the next scheduled tick to happen, then adds the “new” HoT time onto the end. You only get to finish the one next tick though, so unfortunately you can’t cast it a few times in succession and stack it up. Refreshing a HoT also doesn’t reset the tick timer, so if your last tick was going to happen in 0.2s, it will occur 0.2s after you refresh the HoT as you’d expect, and the next tick will follow one tick interval after that. Binding Heal has been changed slightly to take it back to its original positioning. In 3.3.5, Binding Heal cost almost twice as much as Flash Heal, but healed each target for slightly more than a Flash Heal. 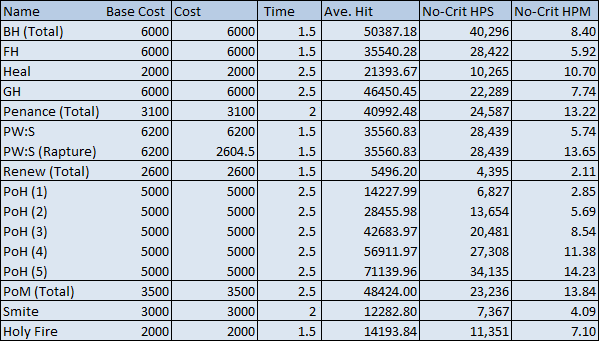 In 4.0.1 though, both cost roughly the same (BH: 1120 mana, FH: 1081 mana) and Binding Heal heals for 2 x 5k (8.9 HPM) while FH heals a single target for 8k (7.4 HPM). So if you’ll get the use out of both heals then Binding Heal is the way to go since it has better HPS and HPM, but you’ll get better performance out of Flash Heal if you’re not injured. Spellpower is all but gone from gear, except for caster weapons (because they have a very high spellpower budget compared to any other slot), and has been converted to Intellect. You now get your spellpower directly from your Intellect, also at a 1:1 ratio. The regen value of intellect has changed because Replenishment has been halved in effectiveness, from 1% of max mana over 5s in the 3.3.5 version to 1% of max mana over 10s in the 4.0.1 version. You may notice your regen taking a bit of a hit if you’re very Int-heavy, but as I’ve said elsewhere, mana is so plentiful that you probably won’t. Because Intellect is now a throughput stat, taking the place of spellpower, it has become a red gem instead of yellow. MP5 is gone as a stat, and every healer is getting Meditation just for picking the Holy, Discipline or Restoration tree to spend 31 points in. As a result Spirit is our only pure regen stat. However, I’d not recommend stacking it in 4.0.1 because you just don’t need the regen at the moment. Focus on the throughput stats instead. Because of the change to Borrowed Time I talked about earlier, if you’re continuing in the bubble-bot role Disc Priests play in current content, you’ll want to get your hands on a bit more haste. Repeating from earlier, you’ll now need 831 haste with BT and Wrath of Air, or 1036 without WoA. If you’re having trouble, you can take points in Darkness in the Shadow tree, which will take the haste rating requirement down to 790/750/711 with WoA or 993/951/910 without it. Although given the low value of spirit at the moment, reforging that into haste should get you there. Crit chance is now also applied to HoT ticks by default, so expect to see Renew crits popping up quite a bit along with Divine Aegis bubbles. You won’t find Mastery on gear before Cataclysm lands, but the stat is available in 4.0.1 and is quite handy to have at the moment. 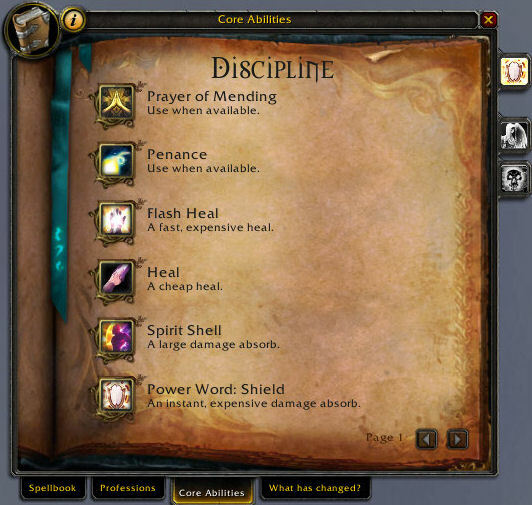 The Disc Priest Mastery is Shield Discipline, which increases the potency of all your damage absorption spells by 20%. Once you start getting Mastery Rating on gear it will convert to Mastery points, and each of these will add a further 2.5% absorption. Int > Haste (to cap) > Spirit (until you don’t have mana problems) > Crit (if you tank heal) or Mastery (if you bubble more). If you’re raiding ICC in the right sort of gear you won’t have mana problems, so Spirit is not valuable right now. Reforging is new in 4.0.1. This allows you, by talking to an NPC found in Enchanting shops, to convert up to 40% of a secondary stat (Spirit, Haste, Hit, Crit, Mastery) on an item into another secondary stat not currently found on the item. The process is fully reversible. At the moment the main target for Reforging is turning as much Spirit as you can spare into Haste to get to the soft cap and then Mastery to bring your bubbles back up to where they used to be. If you want or need more, especially if you’re a raid-healing Disc Priest, you might also reforge some Crit into Haste or Mastery as well. As for meta gems, the Insightful Earthsiege Diamond hasn’t changed, but the Ember Skyflare Diamond has had its 25 SP converted into 21 Intellect, and the 2% intellect has become 2% maximum mana. Because of these conversions, you might find that you’ve lost your yellow gems, so putting a Reckless Ametrine in will help you meet the Insightful Earthsiege Diamond requirement. None of the standard enchants have changed, and since SP or Int are still our top stats I see no reason to change. Glyphing has changed dramatically with 4.0.1. You now learn glyphs by using them, and from then on they’re added to your glyphs pane for use in the future. Swapping them around requires a Vanishing Powder at level 80, and a Dust of Disappearance from 81 onwards which you’ll need to carry around, but it’s a lot easier than carrying around several stacks of different glyphs. There are also now three types of glyphs instead of two: Prime Glyphs are the spec-defining, high-impact ones; Major Glyphs are more utility-focused but still significant; and Minor Glyphs are as unexciting as ever. At level 80, you’ll have access to all 9 slots, 3 for each type of glyph. Here’s the 4.0.1 glyphs for a Disc Priest, in descending order of interest. Glyph of Penance – Mandatory. Penance has huge HPS and HPM, and anything that lets you use it more often is a must-have. Glyph of Power Word: Shield – Not changed since 3.3.5. Still a nice glyph, and definitely a strong contender still. Glyph of Power Word: Barrier – Since PW:B will become your emergency cooldown, your version of Divine Sacrifice, the 10% healing boost you get from this glyph is nice, especially in a raid. Glyph of Prayer of Healing – Leaving a lingering HoT is really useful if you use PoH from time to time. Glyph of Flash Heal – Since Flash Heal’s niche is being shifted to emergency healing this glyph might prove useful at 85, but not in 4.0.1 where heals are still large relative to health pools and people aren’t under 50% health for long. Glyph of Renew – Changed from 3.3.5 to be a flat 10% boost to your Renew. If you use Renew this is very powerful, if you don’t then it’s not. My top pick would be Penance. Other than that, I’d recommend Power Word: Shield and then Prayer of Healing. I’d love to recommend Power Word: Barrier, but on Live PW:B isn’t lasting very long (a couple of seconds in most cases) so using the bonus healing is tricky. As I’ve already said, Major glyphs are generally situational. Keep as many available as you can, and swap them in and out as appropriate. I’ve put some usage notes in this section. Glyph of Dispel Magic – If you’re dispelling a lot, the healing is a nice bonus. Glyph of Divine Accuracy – Increases your Hit chance with Smite by 18%. Pretty much mandatory if you’re using the Smite healing style, not useful (obviously) if you’re not. Glyph of Holy Nova – Holy Nova heals the raid now (it’s range-limited only) making it much more useful than before. This glyph is a very powerful boost to the spell. I’d recommend it. Glyph of Mass Dispel – Replaces the old Focused Power talent, making a quick MD cast available to all Priest specs rather than just Disc. I like this for convenience, but it’s not really a performance boost and definitely optional. Glyph of Fear Ward – On bosses that fear this could prove invaluable, especially in smaller group sizes when a rotation won’t be practical. Highly situational, but if you run 10s without a Tremor Totem available this could save your bacon. Glyph of Inner Fire – Not one to bother with in PvE, but the armour bonus will probably be very useful for PvP. Glyph of Pain Suppression – Another PvP glyph, since stuns in PvE aren’t usually fatal. Glyph of Psychic Scream – This one’s very interesting, making feared targets stand still rather than running away. Nice in heroics as safer emergency CC, but definitely not a raid glyph. Glyph of Smite – Because of the lowered duration of Holy Fire from 12s to 7s, this glyph is not an especially good choice, because the HPS gain from the glyph is approximately cancelled out by the HPS loss from casting HF. It’s a positive but small HPS boost if you Smite for the entire duration, and definitely a DPS gain, but not much of one. I wrote a bit more about this elsewhere. Glyph of Fortitude – As I mentioned earlier, since Power Word: Fortitude is now raid-wide and its cost is quite high, this one might be a good choice to save a ton of mana rebuffing someone who dies during a fight. Glyph of Levitate – As with WotLK, it’s one of the more practical minor glyphs. 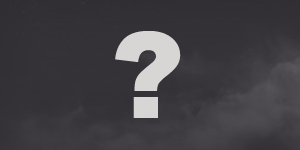 Glyph of Fading – You might find yourself fading more than in WotLK, and some reports say this is the case, although I’ve not found this personally. You shouldn’t need it in a raid, really. Glyph of Shackle Undead – If you need the extra 5 yards to avoid body-pulling, then grab this glyph. Glyph of Shadow Protection – Since Shadow Protection now lasts for an hour, I see zero value in this glyph. I imagine it’ll be changed at some stage, maybe to line up with the Fortitude glyph. Glyph of Shadowfiend – Another less-than-useful glyph, since they changed the Shadowfiend to not take AoE damage. Probably not worth the cost. From this selection I’d pick up Fortitude and Levitate as mandatory glyphs, and then I’m picking between Shackle Undead if I’m using Shackle, or Shadowfiend if I’m not. The first thing to say is that generally speaking, people’s experiences with the PTR suggest that you won’t need to change too much of your healing until Cataclysm itself. Discipline Priests did not get changed anything like as significantly as other specs, and with mana not being constrained at al in 4.0.1 there’s no particular need to change. There’s some mileage in thinking about how you’ll include Heal in you bindings and maybe trying to establish some muscle memory, but if you try and heal Cataclysm-style in 4.0.1 you’ll struggle a lot. If you’re going the Smiting route, your baseline healing on the tank comes from Smiting the boss and letting Atonement heal the lowest-health player with 8 yards of the boss, which ought to be the tank, and using Penance, PW:S and PoM on the tank whenever they’re available. Pop Archangel when it’s at 5 stacks to get 15% of your maximum mana returned and that 15% boost to healing. If you decide not to use the Smite mechanics, just substitute Flash Heal into the above. If you’ve taken Train of Thought and Inner Focus, remember to watch the IF cooldown or macro it to your two expensive heals to get the most benefit from it. The thing to be careful of is checking that Atonement is actually working. Tanks have to stand very close to be within 8 yards of the boss, so they might be out of range, or melee might be taking damage and be soaking up the Atonement heals. In these cases if you’re needed on the tanks then you’ll have to switch to healing them directly. Bubbling is still fairly viable, although you’ll want to reforge a lot of Haste and Mastery onto your gear to match the performance you used to get in 3.3.5. I’d use Flash Heal or Penance for spot heals, since mana is not a problem. The simultaneous Rapture proc trick still works, and the internal cooldown’s reduced to 6s now, so you’ll see a lot more Rapture returns. Power Word: Barrier ought to be a really nice cooldown like Divine Sacrifice was, but unfortunately it’s just not lasting in raids at the moment so it’s only especially useful on the melee or tanks.